The National Living Wage is an obligatory amount based on the real cost of living. The NLW minimum hourly rate is payable to workers from the age of 25 and above in the United Kingdom. NATIONAL LIVING WAGE: Anyone who resides and works in the nation's capital also gets hourly pay increases via the London Living Wage. The increase in the new National Living Wage is a government objective. They want to move workers in the United Kingdom away from a low wage bracket and away from a high welfare society. They also want to see a society which gets higher wages and pays lower amounts of tax. It should reduce the population's dependency on welfare through the UK benefits system. The introduction of the current National Living Wage has one main aim. It is to ensure enterprise pays 'appropriately' for its workforce and reduces the need for state top ups to workers' wages. It got established through a significant amendment to the National Minimum Wage Regulations of 2015. The change in rules ensures that salary rates for workers aged under 25 also apply to those workers entitled to the National Living Wage. In fact, the British Government is boasting figures showing record employment. It also combines with the highest gross domestic product (GDP) growth in monetary value, in all the G7 countries. The Office for Budget Responsibility (OBR) has also pledged to add over one million more jobs to the economy in coming years around the United Kingdom. The government launched a new mandatory National Living Wage (NLW) in April 2019. The hourly pay increase is only for workers aged 25 years and above. It is set at the current rate of £8.21 per hour. That is an improvement of 4.4% compared to the previous National Minimum Wage rate. In real money terms, a full-time worker who is currently receiving the NMW should see a £2,000 increase per annum in earnings (since the original introduction of the NMW in 2016). Note: Workers aged from 21 to 24 years will continue to get the adult National Minimum Wage which is set at £7.70 per hour. 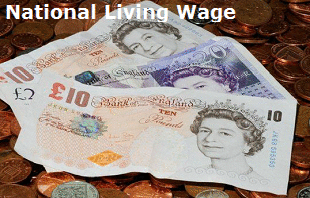 National Living Wage rates appertain to workers' pay. It gets allocated on a monthly reference period beginning from the 1st of April 2019. Pay reference periods beginning or ending either side of April the 1st 2019 will need adjustments. Thus, it means employers need to ensure the correct pay rate for the relevant period. July 2015 saw the government publish its Low Pay Commission (LPC) remit. The result was a move to recommend and stabilize the path for the national living wage for the next few years. The target is for wages to reach 60% of median earnings by the year 2020. The Office for Budget Responsibility forecast that a full-time worker will earn at least £4,400 through the National Minimum Wage by 2020. The Low Pay Commission continues to provide its results and recommendations for workers who are receiving the National Minimum Wage rates. What is the London Living Wage 2019? Not everyone agrees. But, most people consider working as an overriding pathway out of poverty. That said, an increasing number of poorer households in London actually include a person who is in employment. In fact, data suggests that the number of low-paid jobs increased for the fifth consecutive year in the capital city. In actuality, more than 20% of people who live in the borough are considered as being low-paid or paid below the London Living Wage. Important differences exist between a relatively higher minimum wage and the country's voluntary Living Wage pay rate (calculated independently). A statutory minimum set by the Low Pay Commission based on the cost of living in the United Kingdom. All employers will have to pay it to employees over 25 years of age. There is one single National Living Wage rate of £7.83 per hour (for over 25s) for the whole country with no allowance for the higher costs of living in London. After the November 2018 increase the current 'voluntary' UK Living Wage rate is £9.00 and is usually driven by inflation across the United Kingdom. Following the increase in November 2018 the current London Living Wage rate is set at £10.55 per hour to all employees 18 years and over. The rates are set by the Living Wage Commission, and Greater London Authority and recalculated in November (likely to rise each year).